Floor presentations at the Hawaii State Senate and House on Friday, January 26, 2018. We are grateful to Senator Lorraine R. Inouye, Senator Glenn Wakai and Representative Cindy Evans, Representative Jarrett Keohokalole and Representative Nicole E. Lowen for recognizing the importance of the Creative Lab Hawaii (CLH) program for Hawaii creative entrepreneurs, as well as for acknowledging CLH participant Amy Bircher and CLH Executive Director, Michael Palmieri. Floor presentation at the Hawaii State Senate on Monday, March 12, 2018. 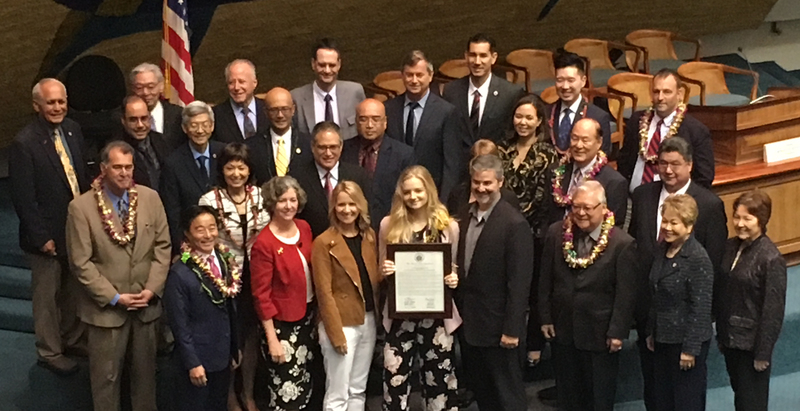 Senator Laura H. Thielen congratulates and recognized Creative Lab Hawaii Music Immersive Participant Olivia Cargile – LIIV on her song placement in a new Fox TV Series and for her participation in the Creative Lab Hawaii Program.